Romitaman Original Comic Book Art :: Private Collection :: Amazing Spider-Man Index #4 Wraparound Double Cover (1985) by artist John Romita Sr.
Click Here To See Amazing Spider-Man Index #4 Comic Book! Check out this "AMAZING" Spider-Man double cover, with pencils by Ron Frenz, and finished pencils and inks by the great John Romita Sr This INCREDIBLE cover was created for the book which reprinted the ENTIRE storylines in book form for The Amazing Spider-Man! Each issue reviewed in the index had a one-page summary and a reduced-size reprint of the original cover. 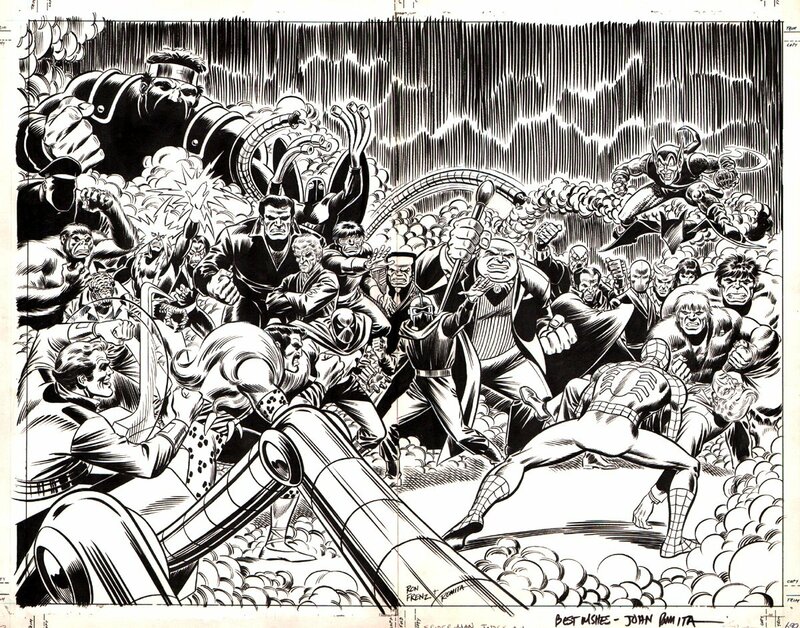 This incredible HUGE wraparound cover (drawn on 2 cover stock board has an actual drawn image area measuring 15 by 20 inches on 2 much larger art boards, depicting Spider-Man holding a dead Captain Stacy in his arms (From Amazing Spider-Man #90) while facing a horde of 21 super-villains and 3 Super Heroes representing EVERY SINGLE ASM villain and hero Spiderman fought from ASM issues 68-122! WOW! The Super-Villains on this breath-taking cover include: Doctor Octopus (ASM 89-90, 100, 112-115), Electro (ASM 82), Green Goblin (ASM 96-98, 100, 121-122), Kingpin (ASM 68-70, 83-85, 100), Kraven (ASM 103-104, 110-112), Lizard (ASM 76-77,100-102), The Smasher (ASM 116-118), the "Big Stoop" Vietnam giant (ASM 108-109) The Gibbon (ASM 110-111), Morbius (ASM 101-102), The Spider-Slayer (ASM 105-106), Prowler (ASM 78-79, 93), Silvermane (ASM 73-75), Man Mountain Marko (ASM 73-75), The Beetle (ASM 94), Hammerhead (ASM 113-115), The Disruptor (ASM 117-118), The Shocker (ASM 72), The Schemer (ASM 83-85), The Chameleon (ASM 80), and The Kangaroo (ASM 81)! The heroes include The Incredible Hulk (ASM 119-120), Quick Silver (ASM 71), and Black Widow (ASM 86)! 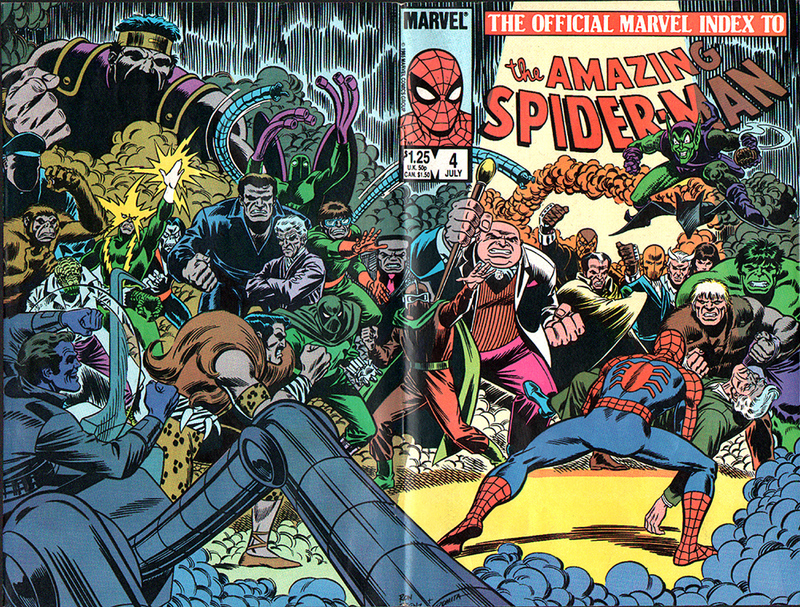 FOLKS.......If you ever wanted JUST 1 representative Spider-Man cover that the great John Romita worked on, which quite honestly, looks like an all John Romita cover..... with "26" Major AMAZING SPIDER-MAN characters on it......How can you POSSIBLY pass up this gem of all Spiderman art gems? Compare this nice cover art to the published comic book in the red link above! ALL HIGH end pieces of art, including this one, are able to be purchased with VERY fair time payment plan options, and trades are always considered towards this and "ANY" art on our website! Just send us an email to mikeburkey@aol.com and we can try to work something out.